Mixed reports on the health of US economy were keeping dollar sentiment in check today. The benchmark dollar index lifted just 0.29% to reach 97.61 after making modest gains versus the euro, sterling and the Canadian. Yields on US treasuries dipped for a second day. The 10Y fell to 2.15% and the 5Y stood at 1.51% following a slip of three basis points. Of the two manufacturing reports today Markit provided the most positive outlook on the state of the sector. The monthly survey for July remained static at 53.8 acording to the data collection firm – meeting estimates. The ISM purchasing managers’ index – a closely watched barometer of the health of the sector – dropped to 52.7, which caused a minor disappointment. After Friday’s robust Chicago PMI report it was hoped that activity in US manufacturing had finally picked up pace from its sluggish start to the year – thought to be related to the strong dollar. Also missing estimates was the latest data from the construction sector. Month on month the construction spend increased by just 0.1% in July. This fell far wide of the 0.6% that was expected. Additional disappointment came on the fact that non-residential developments experienced a sharp slowdown. 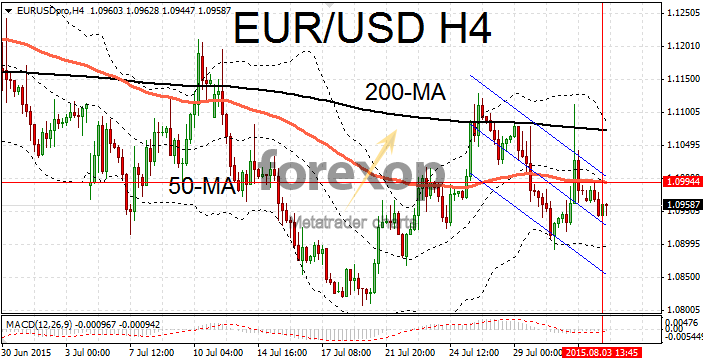 EUR/USD remains range bound keeping well below the 1.10 ceiling and continues to be driven by the dollar. 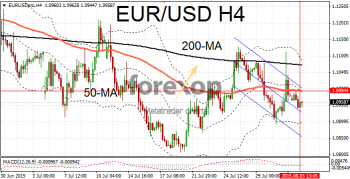 The four hourly is displaying a moderately falling range and the level continues to trend below the 50-point moving average. The re-opening of the Athens stock exchange brought the ongoing debt crisis back to the fore and depressed sentiment. Stocks in Greece’s precarious banking sector were the hardest hit after the five week closure with some falling by up to 30%. Activity in the German, French and Italian manufacturing sectors outpaced expectations according to the latest survey by Markit. Only Spain saw a minor fall in activity in July with the PMI dropping to 53.6 from 54.7 in June. USD/JPY dropped to the support area at 123.86. The market began to weaken around midday after the disappointing data on US manufacturing. Traders will be positioning for the several key reports due this week which could impact the yen. Thursday will see the release of a flash estimate of a closely watched business survey – the leading index report. This will be followed by a statement by the Bank of Japan monetary policy on Friday.